It’s official: Fish pedicures aren’t just a bizarre beauty ritual with shady animal-welfare considerations, they’re also downright dangerous to your health, according to the U.S. Centers for Disease Control and Prevention. On Wednesday, the federal agency published a report by U.K.’s Centre for Environment, Fisheries & Aquaculture Science, which examined the types of bacteria associated with Garra rufa, an inch-long toothless carp that nibbles away at dead skin. 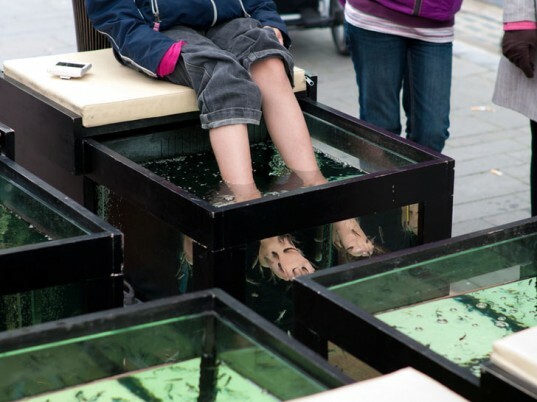 Native to Southeast Asia, the so-called “doctor fish” soared in popularity in 2008, when salons across the nation began offering them as an alternative to razors for scraping away calluses. The ick factor was one thing, but public-health officials also cautioned against the procedure, citing the risk of dangerous skin and soft-tissue infections for people with open sores, skin cuts, underlying medical conditions such as diabetes, and compromised immune systems as a result of AIDS, cancer, or advanced age. Warnings from public-health officials led 14 states, including California, to ban fish pedicures. But although the warnings led at least 14 states, including California, Florida, and Texas, to ban fish pedicures, actual data regarding the bacteria carried by the fish has been slim—till now, at least. “Our study identified some of the species of bacteria associated with this fish species, including some that can cause infections in both fish and humans,” lead researcher David Verner-Jeffreys told a wire service. Water, he added, is a fertile breeding ground for all manner of nasties. Couple that with bacteria living on fish scales or waste and the tiniest cut could make the risk of infection a reality. In April 2011, a bacterial outbreak among 6,000 G. rufa imported from Indonesia to British salons and spas revealed colonies of Streptococcus agalactiae, a group of bacteria that can lead to sepsis, meningitis, or pneumonia. Water is a fertile breeding ground for bacteria, increasing the risk of infection with the tiniest cut. These bacteria included Aeromonas, which causes wound infections and gastrointestinal problems in humans, and Mycobacteria, which Verner-Jeffrey’s team recognized as responsible for skin infections in some pedicure clients in the United Kingdom. Worse, the researchers found that most of the bacteria were resistant to multiple drugs. Our advice? Stick with the pumice stone and let the fish swim free.